Ancient Greek culture spans over a thousand years, from the earliest civilizations to the cultures that became the Ancient Greeks. Ancient Greek culture is noted for its government, art, architecture, philosophy, and sports, all of which became foundations for modern western society. It was admired and adopted by others, including Alexander the Great and the Romans, who helped spread Greek culture around the world. Before Greek culture took root in Greece, early civilizations thrived on the Greek mainland and the Aegean Islands. The fall of these cultures and the aftermath, known as the Dark Age, is believed to be the time when the Homeric epics were first recited. Greek culture began to develop during the Geometric, Orientalizing, and Archaic periods, which lasted from 900 to 480 BCE. During this time the population of city-states began to grow, Panhellenic traditions were established, and art and architecture began to reflect Greek values . The Early, High, and Late Classical periods in Greece occurred from 480 to 323 BCE. During these periods, Greece flourished and the polis of Athens saw its Golden Age under the leadership of Pericles . However, city-state rivalries lead to wars, and Greece was never truly stable until conquered. The Hellenistic period in Greece is the last period before Greek culture becomes a subset of Roman hegemony . This period occurs from the death of Alexander the Great in 323 BCE, to the Greek defeat at the Battle of Actium in 30 BCE. It marks the spread of Greek culture across the Mediterranean. polis: A city, or a city-state. Its plural is poleis. Ancient Greek culture covers over a thousand years of history, from the earliest civilizations in the area to the cultures that became the Ancient Greeks. Following a Greek Dark Age, Greece once more flourished and developed into the ancient culture that we recognize today . Classical Greece: Map of Ancient Greece. Greek culture is based on a series of shared values that connected independent city-states throughout the region, and expanded as far north as Mount Olympus. Greek society was insular, and loyalties were focused around one’s polis (city-state). Greeks considered themselves civilized and considered outsiders to be barbaric. While Greek daily life and loyalty was centered on one’s polis, the Greeks did create leagues, which vied for control of the peninsula, and were able to unite together against a common threat (such as the Persians). Greek culture is focused on their government, art, architecture, philosophy, and sport. Athens was intensely proud of its creation of democracy, and citizens from all poleis (city-states) took part in civic duties. Cities commissioned artists and architects to honor their gods and beautify their cities. Greek philosophers, mathematicians, and thinkers are still honored in society today. As a religious people, the Greeks worshipped a number of gods through sacrifices, rituals, and festivals. During the Bronze Age, several distinct cultures developed around the Aegean. The Cycladic civilization, around the Cyclades Islands, thrived from 3,000 to 2,000 BCE. Little is known about the Cycladic civilization because they left no written records. Their material culture is mainly excavated from grave sites, which reveal that the people produced unique, geometric marble figures. The Minoan civilization stretches from 3700 BCE until 1200 BCE, and thrived during their Neopalatial period (from 1700 to 1400 BCE), with the large-scale building of communal palaces. Numerous archives have been discovered at Minoan sites; however their language, Linear A , has yet to be deciphered. The culture was centered on trade and production, and the Minoans were great seafarers on the Mediterranean Sea. A proto-Greek culture known as the Mycenaeans developed and flourished on the mainland, eventually conquering the Aegean Islands and Crete, where the Minoan civilization was centered. The Mycenaeans developed a fractious, war-like culture that was centered on the authority of a single ruler. Their culture eventually collapsed, but many of their citadel sites were occupied through the Greek Dark Age and rebuilt into Greek city-states. From around 1200 BCE, the palace centers and outlying settlements of the Mycenaeans’ culture began to be abandoned or destroyed. By 1050 BCE, the recognizable features of Mycenaean culture had disappeared. Many explanations attribute the fall of the Mycenaean civilization and the collapse of the Bronze Age to climatic or environmental catastrophe, combined with an invasion by the Dorians or by the Sea Peoples, or to the widespread availability of edged weapons of iron, but no single explanation fits the available archaeological evidence. This two- to three-century span of history is also known as the Homeric Age. It is believed that the Homeric epics The Iliad and The Odyssey were first recited around this time. The Geometric period (c. 900–700 BCE), which derives its name from the proliferation of geometric designs and rendering of figures in art, witnessed the emergence of a new culture on the Greek mainland. The culture’s change in language, its adaptation of the Phoenician alphabet, and its new funerary practices and material culture suggest the ethnic population changed from the mainland’s previous inhabitants, the Mycenaeans. During this time, the new culture was centered on the people and independent poleis, which divided the land into regional populations. This period witnessed a growth in population and the revival of trade. The Orientalizing period (c. 700–600 BCE) is named for the cultural exchanges the Greeks had with Eastern, or Oriental civilizations. During this time, international trade began to flourish. Art from this period reflects contact with locations such as Egypt, Syria, Assyria, Phoenicia, and Israel. 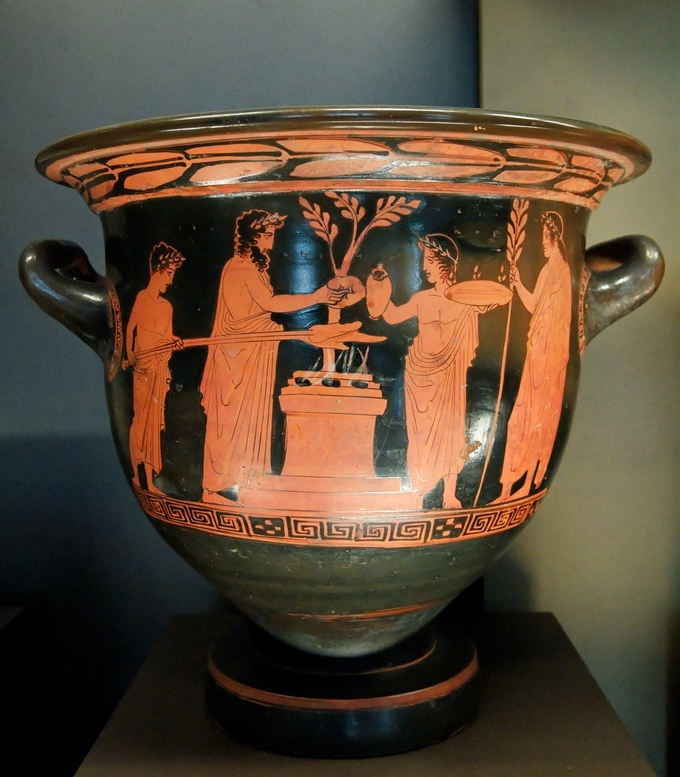 Greece’s Archaic period lasted from 600 to 480 BCE, in which the Greek culture expanded. The population in Greece began to rise and the Greeks began to colonize along the coasts of the Mediterranean and the Black Sea. The poleis at this time were typically ruled by a single ruler who commanded the city by force. For the city of Athens, this led to the creation of democracy. Several city-states emerged as major powers, including Athens, Sparta, Corinth, and Thebes. These poleis were often warring with each other, and formed coalitions to gain power and allies. The Persian invasion of Greece in 480 BCE marked the end of the Archaic period. The era of Classical Greece began in 480 BCE with the sacking of Athens by the Persians. The Persian invasion of Greece, first lead by Darius I and then by his son Xerxes, united Greece against a common enemy. With the defeat of the Persian threat, Athens became the most powerful polis until the start of the Peloponnesian War in 431 BCE. These wars continued on and off until 400 BCE. While marred by war, the Classical period saw the height of Greek culture and the creation of some of Greece’s most famous art and architecture. However, peace and stability in Greece was not achieved until it was conquered and united by Macedonia under the leadership of Philip II and Alexander the Great in the mid-third century BCE. The Hellenistic period began with the death of Alexander the Great in 323 BCE, and ended with the Roman victory at the Battle of Actium in 30 BCE. Greece poleis spent this time under the hegemony of foreign rulers, first the Macedons and then the Romans, starting in 146 BCE. New centers of Hellenic culture flourished through Greece and on foreign soil, including the cities of Pergamon, Antioch, and Alexandria—the capitals of the Attalids, Seleucids, and Ptolemies. Greek religion played a central and daily role in the life of ancient Greeks, and group worship was centered on the temple and cult sites. The history of the Greek pantheon begins with the primordial deities Gaia and Uranus and their children, the Titans. The pantheon of Greek gods consisted of twelve Olympian gods plus a variety of additional principal and minor gods and goddesses. The gods had human characteristics and personalities, and their lives were detailed by the mythologies told about them. The gods played a central role in Greek daily life. They were consulted, blamed, and honored for a variety of reasons, including natural occurrences (from earthquakes to rain), as well as for the public and private affairs of the polis and its people. The mythologies and cult worship of heroes also played an important role in Greek religion and ritual . Heroes—especially Perseus, Hercules , Theseus, and those involved in the Trojan War—were often depicted in art, and the location of their feats became cult sites. The temple was considered the home of the god and was often an expensive and lavishly decorated building. The temple included a naos , the main room that held the cult statue. Offerings and dedications were left for the gods, and sacrifices took place outdoors. primordial: Existing at or before the beginning of time. demigod: A half-god or hero; the offspring of a deity and a mortal. libation: The act of pouring a liquid or liquor, usually wine, either on the ground or on a victim in sacrifice, in honor of some deity. naos: The central room in the god’s temple, where a cult statue of the god is erected. polytheistic: A religious system whose members worship many deities. votive: A small religious offering deposited at a temple without the purpose of display or retrieval. Greek religious traditions encompassed a large pantheon of gods, complex mythologies, rituals, and cult practices. Greece was a polytheistic society, and looked to its gods and mythology to explain natural mysteries as well as current events. Religious festivals and ceremonies were held throughout the year, and animal sacrifice and votive offerings were popular ways to appease and worship the gods. Religious life, rituals, and practices were one of the unifying aspects of Greece across regions and poleis (cities, or city-states , such as Athens and Sparta). 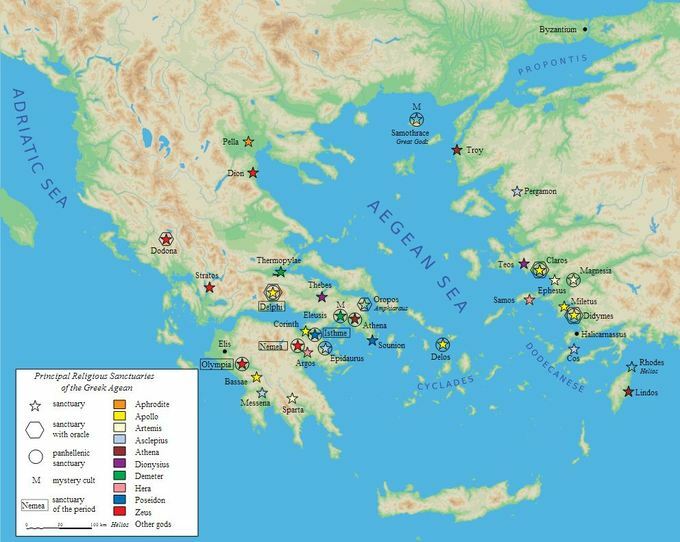 The principal religious sanctuaries of the Greek Aegean: This map lists the major Greek gods and shows where their principal religious sanctuaries are located throughout the Greek Aegean region. Greek gods were immortal beings who possessed human-like qualities and were represented as completely human in visual art. They were moral and immoral, petty and just, and often vain. The gods were invoked to intervene and assist in matters large, small, private and public. City-states claimed individual gods and goddess as their patrons . Temples and sanctuaries to the gods were built in every city. Many cities became cult sites due to their connection with a god or goddess and specific myths. For instance, the city of Delphi was known for its oracle and sanctuary of Apollo, because Apollo was believed to have killed a dragon that inhabited Delphi. The history of the Greek pantheon begins with the primordial deities Gaia (Mother Earth) and Uranus (Father Sky), who were the parents of the first of twelve giants known as Titans. Among these Titans were six males and six females. The males were named Oceanus, Hyperion, Coeus, Crius, Iapetus, and Kronos. The females were named Themis, Mnemosyne, Tethys, Theia, Phoebe, and Rhea. Kronos eventually overthrew Uranus and ruled during a mythological Golden Age. Over time, he and Rhea had twelve children who would become the Olympian gods. However, Kronos heard a prophecy that his son would overthrow him, as he did to Uranus. In an effort to avert fate, he ordered Rhea to allow him to devour each of the children upon their birth. Themis: One of the first 12 Titans, Themis was the personification of divine law, as opposed to human ordinance. Best known among the pantheon are the twelve Olympian gods and goddesses who resided on Mt. Olympus in northern Greece. Zeus, the youngest son of Rhea and Kronos, was hidden from his father, instead of being swallowed. Once he became a man, he challenged his father’s rule, forcing Kronos to regurgitate the rest of his swallowed children. These children were Zeus’s siblings, and together they overthrew Kronos, making Zeus the father of gods and men. Violence and power struggles were common in Greek mythology, and the Greeks used their mythologies to explain their lives around them, from the change in seasons to why the Persians were able to sack Athens. Zeus’ two brothers, Poseidon (who ruled over the sea) and Hades (who ruled the underworld). Zeus’s sister and wife, Hera, the goddess of marriage, who is frequently jealous and vindictive of Zeus’s other lovers. Their sisters Hestia, the goddess of the hearth, and Demeter, the goddess of grain and culture . Athena (goddess of warfare and wisdom). Hermes (a messenger god and god of commerce). the twins Apollo (god of the sun, music, and prophecy) and Artemis (goddess of the hunt and of wild animals). Dionysos (god of wine and theatre). Aphrodite (goddess of beauty and love), who was married to Hephaestus (deformed god of the forge). Ares (god of war and lover of Aphrodite) are also part of the traditional pantheon. Hephaestus was in some mythologies the son of Zeus while in others the fatherless son of Hera. Hermes and the Infant Dionysos by Praxiteles: Here, Hermes cares for the now motherless Dionysos. Originally, Hermes held a bunch of grapes, with which he teased the infant god of wine. c. 4th century BCE. Heroes, who were often demigods , were also important characters in Greek mythology. The two most important heroes are Perseus and Hercules. Perseus is known for defeating the Gorgon, Medusa. He slew her with help from the gods: Athena gave him armor and a reflective shield, and Hermes provided Perseus with winged sandals so he could fly. Hercules was a strong but unkind man, a drunkard who conducted huge misdeeds and social faux pas. Hercules was sent on twelve labors to atone for his sins as punishment for his misdeeds. These deeds, and several other stories, were often depicted in art, on ceramic pots, or on temple metopes . The most famous of his deeds include slaying both the Nemean Lion and the Hydra, capturing Cerberus (the dog of the underworld), and obtaining the apples of the Hesperides. A third hero, Theseus, was an Athenian hero known for slaying King Minos’s Minotaur . Other major heros in Greek mythology include the warriors and participants of the Trojan War, such as Achilles, Ajax, Odysseus, Agamemnon, Paris, Hector, and Helen. Hero cults were another popular form of Greek worship that involved the honoring of the dead, specifically the dead heroes of the Trojan War. The sites of hero worship were usually old Bronze Age sites or tombs that the ancient Greeks recognized as important or sacred, which they then connected to their own legends and stories. Hercules and Cerberus : Hercules bringing Cerberus back to King Eurystheus. Black figure hydra. c. 525 BCE. Greek worship was centered on the temple. The temple was considered the home of the god, and a cult statue of the god would be erected in the central room, or the naos. Temples generally followed the same basic rectangular plan, although a round temple, known as a tholos , were used at some sites in starting in the Classical period. Temples were oriented east to face the rising sun. Patrons would leave offerings for the gods, such as small votives, large statues, libations or costly goods. Due to the wealth dedicated to the gods, the temples often became treasuries that held and preserved the wealth of the city. Greek temples would be extensively decorated, and their construction was a long and costly endeavor. Rituals and animal sacrifices in honor of the god or goddess would take place outside, in front of the temple. Rituals often included a large number of people, and sacrifice was a messy business that was best done outdoors. The development and decoration of temples is a primary focus in the study of Greek art and culture. Sacrificial scene: Scene of a sacrifice. 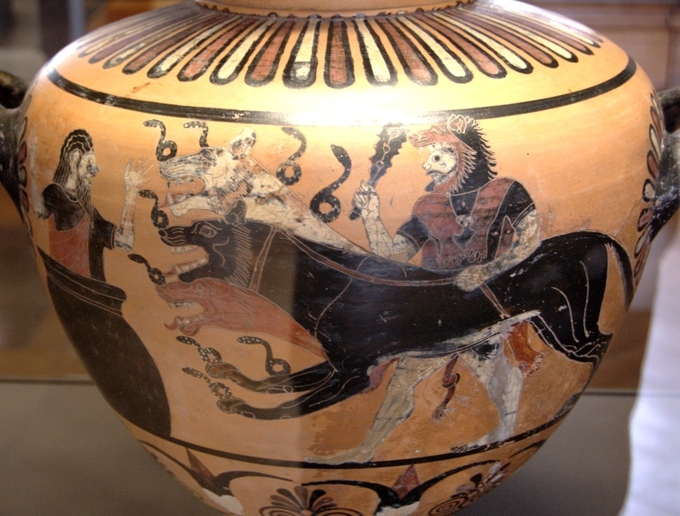 Attic red-figure bell krater. Circa 430–420 BCE. Athens, Greece.